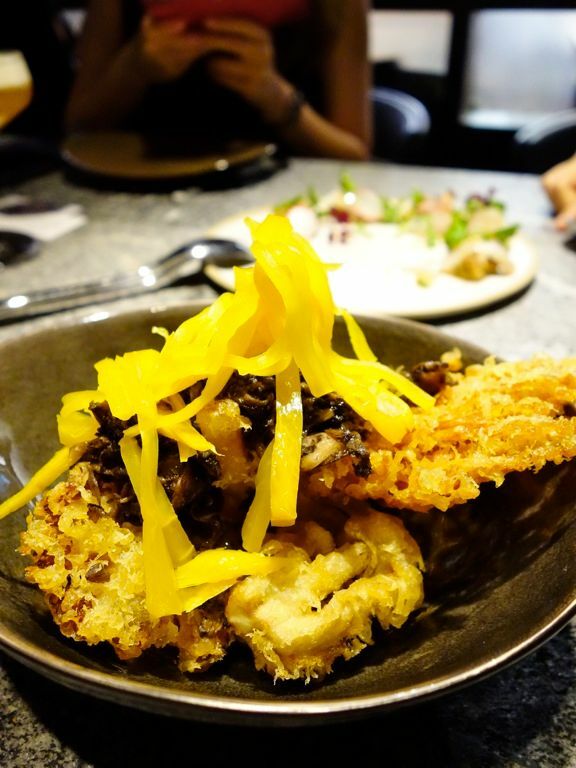 Telok Ayer, Amoy, and Gemmils is dining hotspot central. The number of restaurants and cafes that I fancy there is astonishing- Moosehead, Maggie Joan's, BoChinche to name a few. 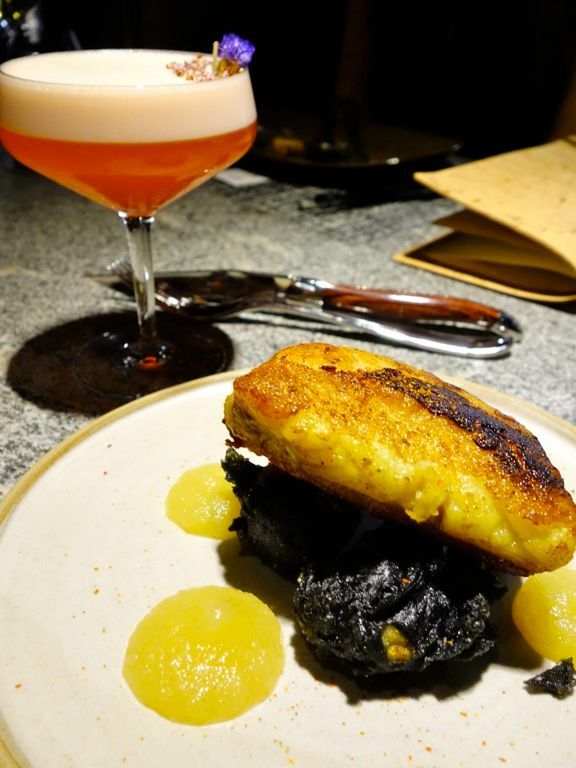 And now adding to the favorites list is the super underground French-Japanese tapas bar Le Binchotan! 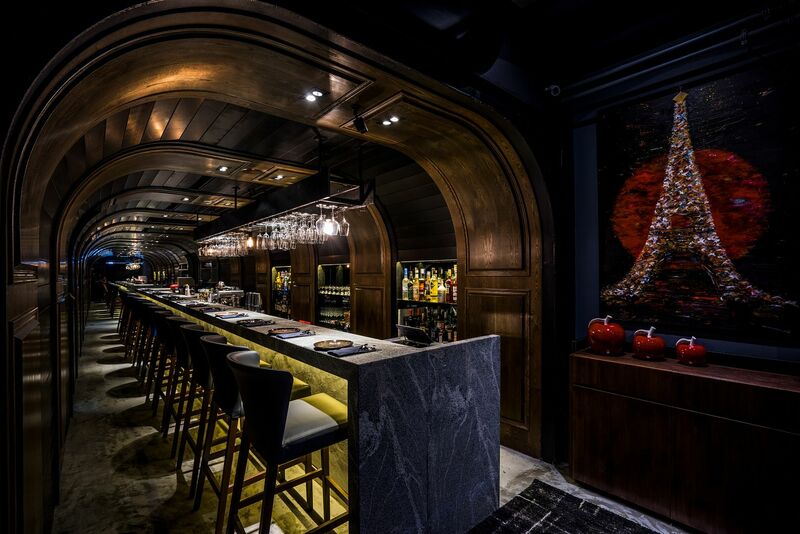 Underground it is with a dark cozy speakeasy vibe- a common bar counter runs through the entire length of the restaurant, with smaller enclaves built into the walls for semi-private gatherings over binchō-tan (white charcoal) grilled skewers of meats and seafood. 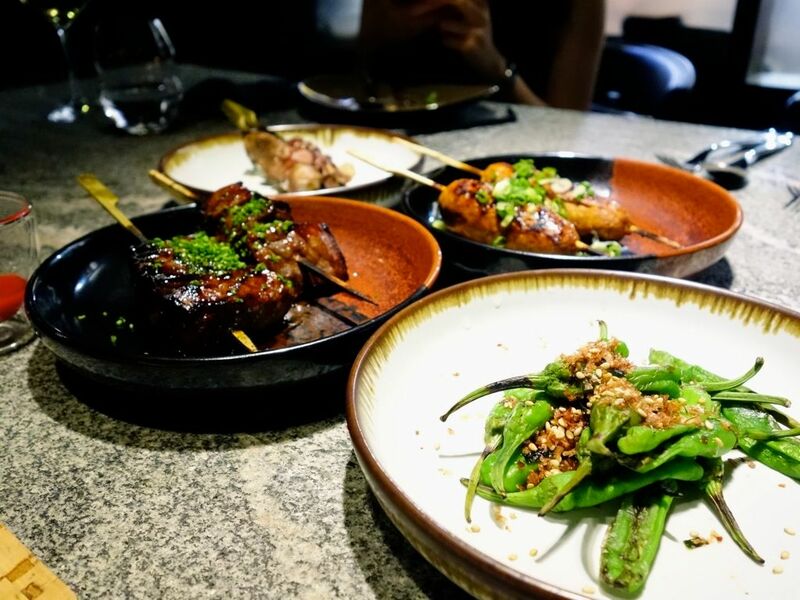 The flavors are largely Japanese, no surprise actually since the menu is created by Chef Atsuhiko Hagiwara from Ginza Tokyo restaurant en.terrible; together with Singapore Head Chef Jeremmy Chiam. 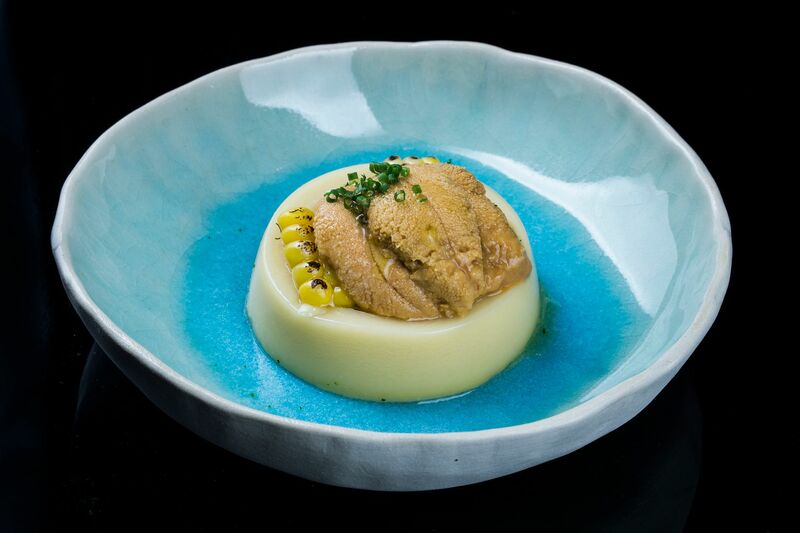 Meats and seafood are smoked over binchō-tan (white charcoal) and ingredients like uni (sea urchin roe), daikon and miso have also been infused into the dishes. Dinner started proper with drinks while we waited for the small plates to be fired. Cocktails and wine pairings by Head Bartender Sugar Ray Ruban is available. Ladies, start with the Freedom of Peach, a blushing Rose that will sweeten your night. 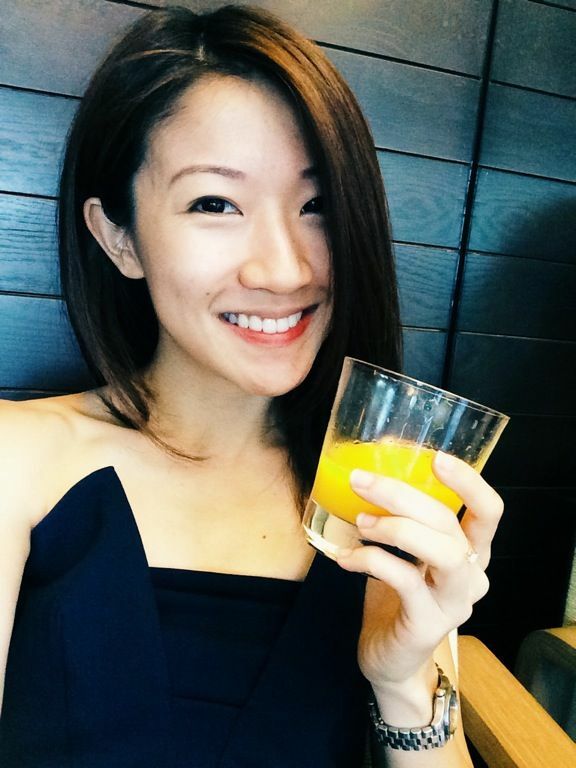 The cocktails were all very refreshing. My preferred? The Sake My Cucumber ($21), a Japanese G&T; and the Leon: Tea Professional ($21), an Earl grey infused whisky with lemon egg white, and spiced apple. One of my favorite dishes was the shaven Foie Gras ($21), which added a creamy texture to the well cooked oden-style daikon. 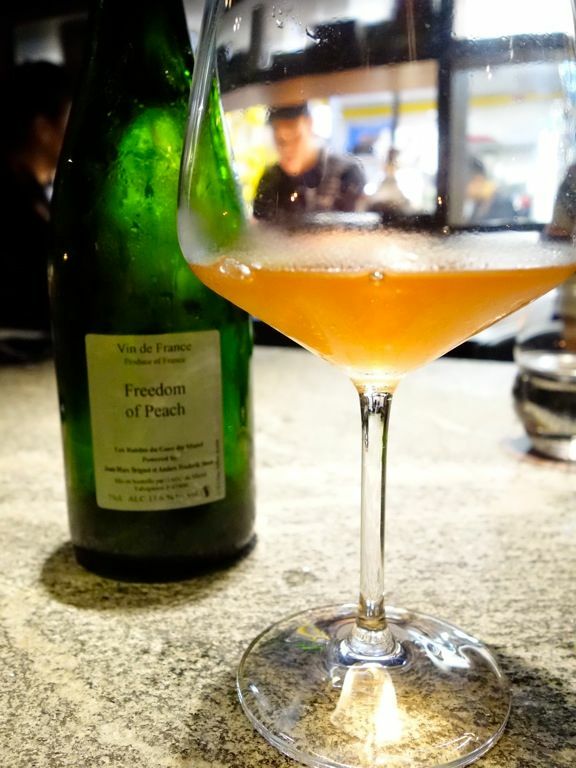 It may sound very strange but the combination of the ingredients, including the dashi jelly, was refreshing, especially since the dish is served cold. 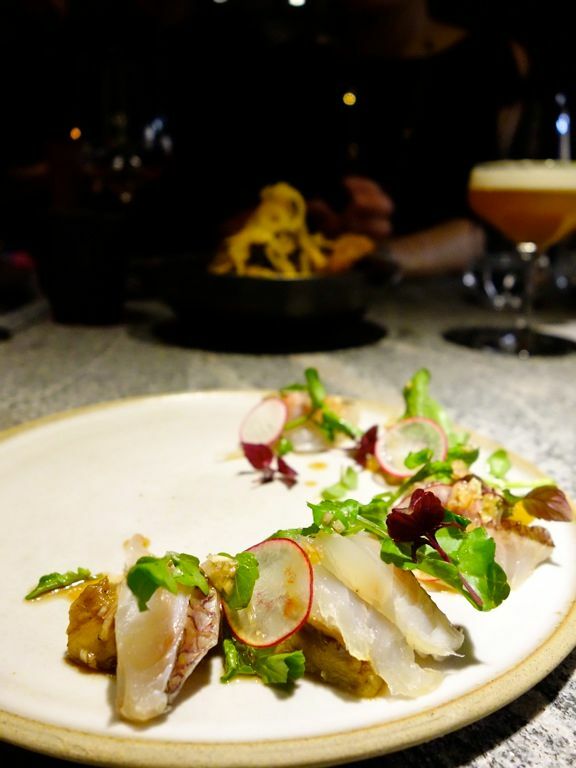 Also, order the Madai ($25), another starter that will whet your appetite with the tart sherry vinaigrette that is paired with the smoked sea bream. Of course, i cannot resist eggs when i see them on the menu and the Sakura Ebi ($19) turned out to be a spectacular brunchy dish that is probably the most french-like of the lot. 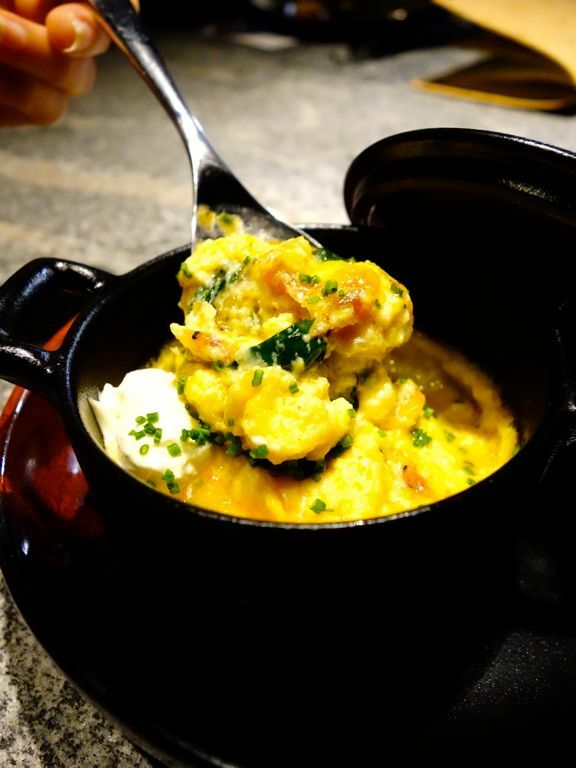 Creamy baked eggs with mascarpone and Parmesan, plus a rich sakura ebi essence. UMAMI. 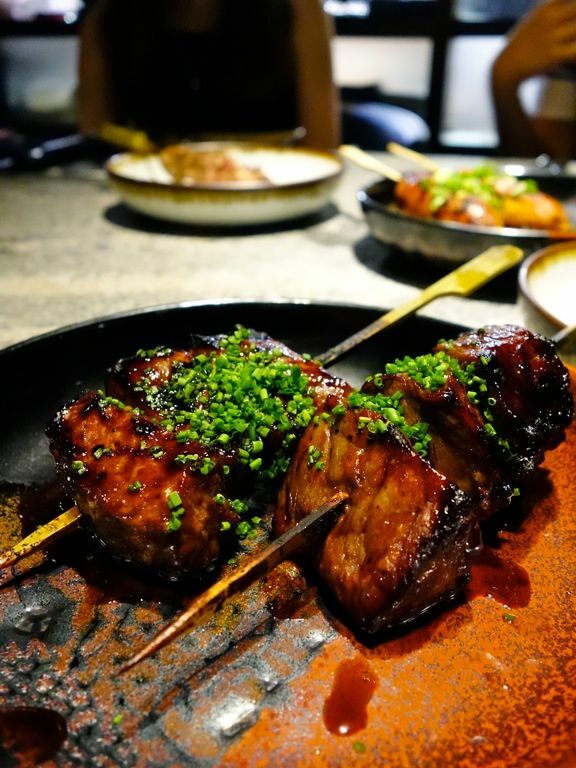 From the Charcoal (Sticks) section, the Chicken Tsukune ($13) was a juicy blend of 90% chicken thigh and 10% soft bone, along with ginger, garlic and spring onion. For the Wagyu Striploin ($15), do tell the chefs to do it medium-rare instead. Typically served medium-well, the meat was too tough for me. Plus the ume sauce threw the dish off balance with the extreme sourness. 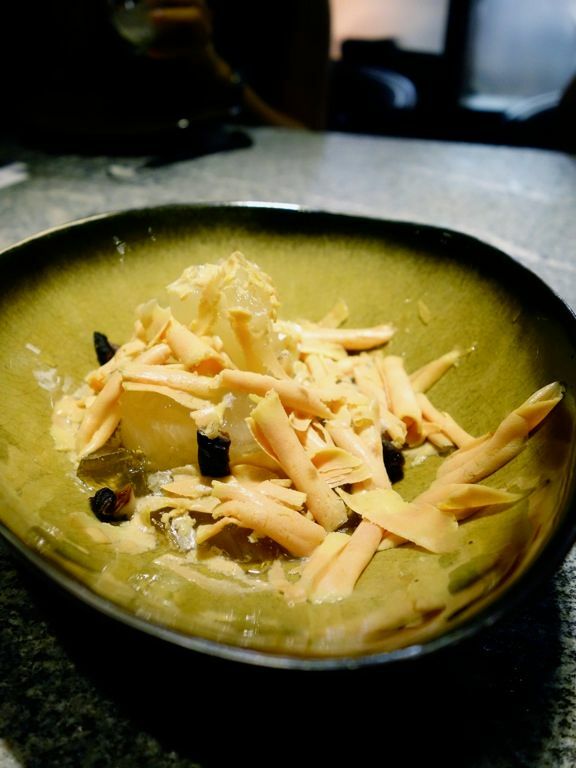 Also to skip the Tenkasu ($15), an oily deep fried dish of enoki, mushroom ragout and pickled daikon. The ingredients simply did not come together as a dish. On to the big plates. 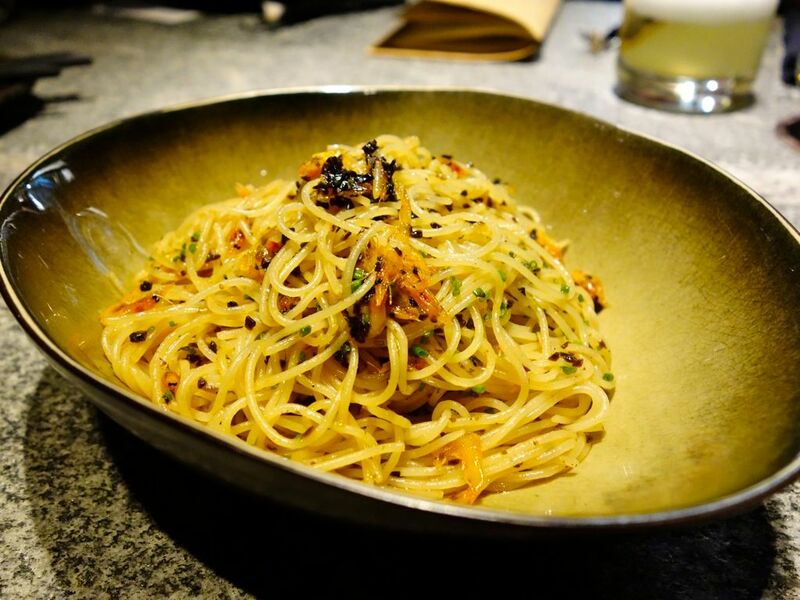 Have the Prawn Dumplings with Capellini ($29) which provided delightful bursts of umami with the shio konbu. 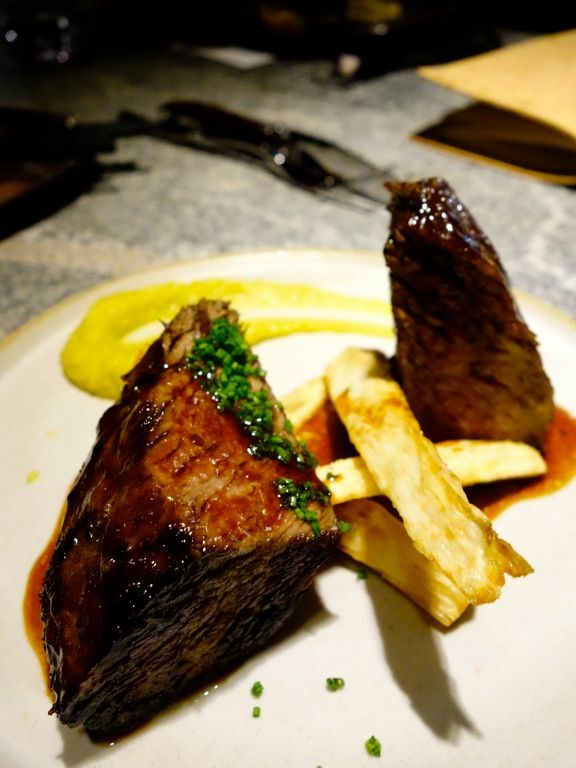 The cow did not die in vain in the Angus Short Rib ($39) dish. The meat was sous vided and paired with leek, nagaimo, and kurosu jus. A light tangy black vinegar brought out the meaty flavors of the lovely red. 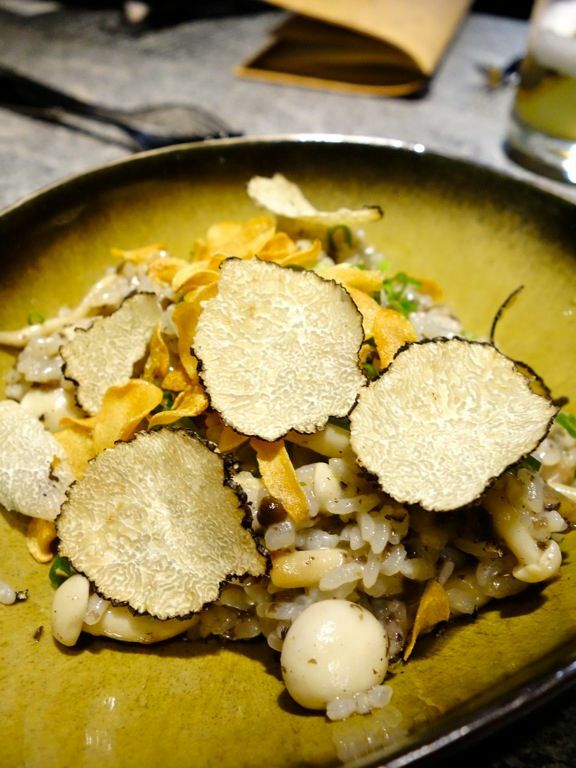 The Fungi ($29) is reminiscent of a Chazuke but took on more of a risotto presentation, especially with the shaved truffles but the Japanese flavors are strong in this one. Skip the Iberico Pork Jowl ($35). I was expecting comforting flavors of a typical Katsu curry but there was none. 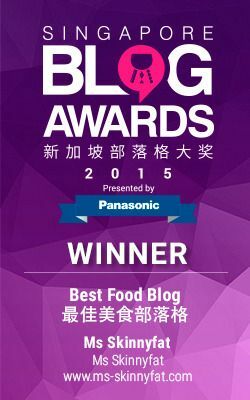 Instead, the bland hint of curry scent failed to flavor the dish and the meat was fatty and oily as well. A small selection of desserts is available, both light and snowy endings to the night. 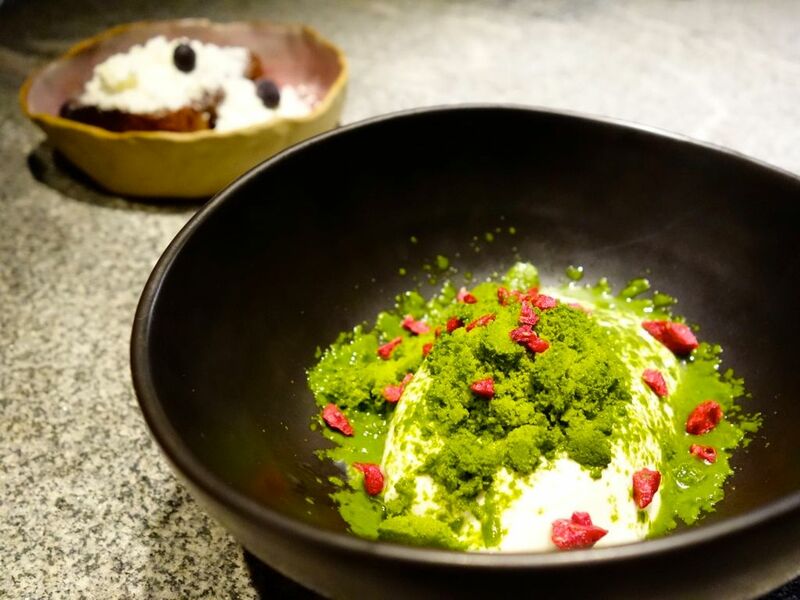 The Coconut pudding ($15) is a milky panna cotta, served with a matcha snow. Also, the Smoked Chocolate ($15) also performed a disappearing act in our mouth (but left a lingering presence). The tapas bar concept is going strong at Amoy Street! Make sure you check out Le Binchotan next! Psst, make a reservation if not you may not score a spot!